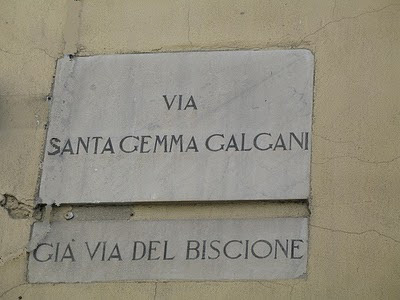 "Via Santa Gemma- St Gemma's road to God"
Gemma's extraordinary love for God is what captivates and inspires many people. She loved Jesus with all her heart and she expressed this love so well in her words and in her writings. And those who are devoted to her want to make her prayers their own, and they seek her intercession in helping them to love God more deeply, to repent of their past faults, and to learn to sacrifice and suffer out of love for Jesus. Because Gemma loved Jesus with all her heart! And that is her lesson for everyone. 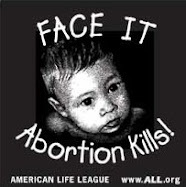 “My child, I have need of victims; strong victims, in order to appease the just anger of my Divine Father. I need souls who, by their sufferings, trials and sacrifices, make amends for sinners and for their ingratitude "
-All for the love of Jesus and loving Jesus with all of one’s heart. That is the lesson that Gemma teaches us. Saint Gemma often prayed before the miraculous "Volto Santo” (Holy Face in English) in the Cathedral of San Martino in her hometown of Lucca. It is before this iamge of the Volto Santo or “Holy Face” that Gemma would pour out the love and concerns of her heart to her beloved Jesus. 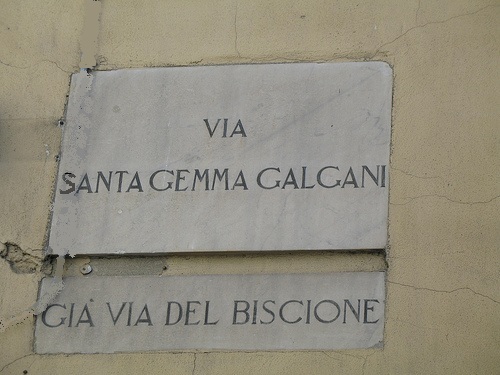 In fact we read in her Autobiography that it was before the Volto Santo crucifix in the Cathederal of Santo Martino that Gemma saw and met the Passionists for the first time. I cannot describe the impression made on me when I saw those priests preach! The impression was very great because I saw that they were clothed with the same kind of habit that Brother Gabriel was wearing the first time I saw him (in a vision -ed.) I was seized with such an affection for them that I never missed a sermon from that day until the end of the mission. "The last day of the mission arrived and all the people were gathered in the church for the general Communion. I was among the large crowd and Jesus, who was greatly pleased, made Himself strongly felt by my soul and he said to me: "Gemma, do you like the habit that priest is wearing?" (He indicated a Passionist who was somewhat distant from me.) I did not answer with words but my heart answered him with its palpitations. He added: "Would you like to be clothed with the same habit?" "My God!" I exclaimed, "Yes." Jesus continued, "You will be a daughter of my Passion, and a well beloved daughter. One of these sons (of the Passion) will be your father. Go and reveal everything." And I saw that Jesus indicated Father Ignatius." So, we see in Gemma's own words how Jesus spoke to her before the Volto Santo crucifix in the Cathederal of Santo Martino. But what are the origins of this miraculous crucifix? 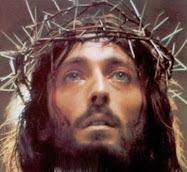 The wooden crucifix known as Volto Santo (Holy Face) was also known in earlier times as the Holy Cross. It is reverently enshrined in a free-standing, small octagonal structure (Tempietto) located in the north aisle of the cathedral dedicated to St. Martino in Lucca, Italy. Surrounding the holy figure are countless silver and gold hearts, crosses, rings, pins and medallions which were offered as tokens of appreciation for the miracles and favors received from the wonder-working image. An ancient legend tells that the crucifix was carved from a cedar of Lebanon by a man named Nicodemus. The legend also reveals that the Italian Bishop Gualfredo, while he was a pilgrim in the Holy Land, obtained possession of the Volto Santo and embarked with it in a boat without a crew or sails. Finally, after miraculously escaping pirates, the boat drifted through the Mediterranean and went ashore on the beach at Luni, near La Spezia. 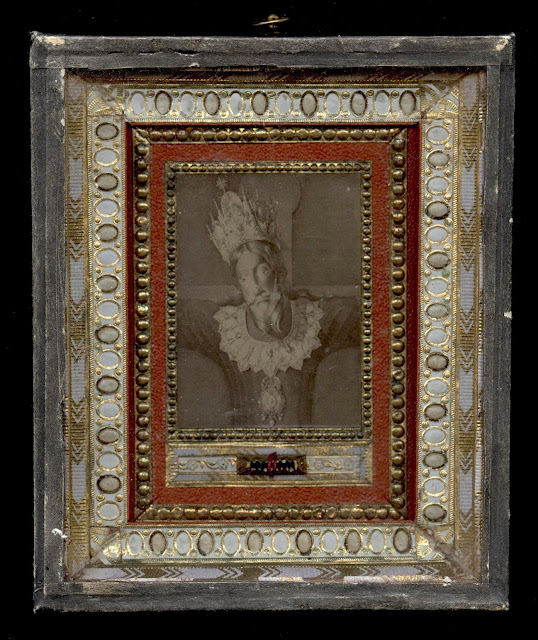 As the worshippers at Luni and Lucca disputed possession of the holy image, the Bishop of Lucca decided to leave the choice of its final destination to the Divine Will. Placing it on a cart driven by oxen, the animals-of their own accord-set off for Lucca. This is said to have taken place during the eighth century. intervention. Since the time of this miracle one of the slippers of the Volto Santo has been supported by a silver cup resembling a chalice. In the Middle Ages the legend of the Holy Cross and the reports of its miracles spread quickly throughout France, Flanders, London and all the countries visited by the merchants of Lucca. The image was so well known in England that even the monarchy knew of it. It is said that King William II of England used to swear "per sanctum vultum de Luca' ("by the holy face of Lucca"). Disputing the legend previously mentioned, it is the prevailing opinion that the Volto Santo is the work of a Lombard master of the second half of the eleventh century. Extant documents make mention that the Volto Santo was preceded in St. Martino's by another crucifix of which there are no records, except that it is known to have been very old. This might have been the crucifix of the legend. 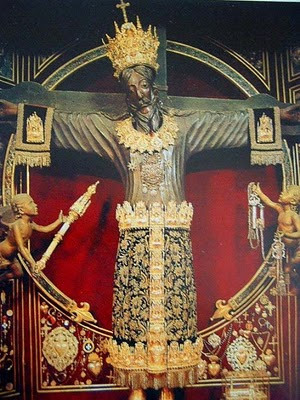 Regardless, the Volto Santo has been regarded as miraculous since its arrival in Lucca, a claim that has always been respected. 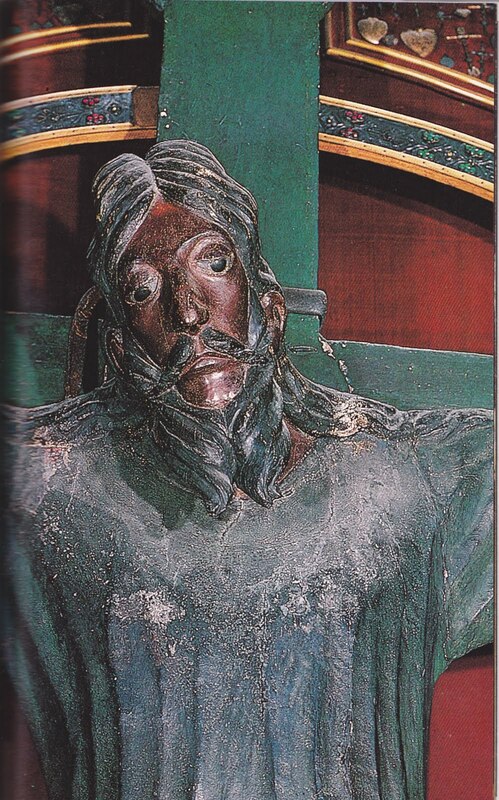 The holy crucifix was originally of polychrome wood, but the blackening produced during the centuries by the smoke of candles and incense has given the whole figure a very distinctive gloss. During the annual September festivities in honor of the Holy Cross, the Volto Santo is adorned with precious ornaments: a velvet tunic lavishly decorated with gold embroidery, a tall golden crown, a gold collar and costly ornaments. On the thirteenth of September at sunset, a candlelight procession, attended by the whole of Lucca, makes its way through the town. Gemma surely attended these yearly celebrations with the joy of seeing her Jesus loved and honored by the many people, and with her heart all on fire with love for Him. ~May Saint Gemma teach us to love Jesus with all our hearts, and to sacrifice and suffer out of love for Him. St Gemma, pray for us! "Oh Jesus, how are You doing in my heart? ... In the narrow cell of my chest in love with you tell me, oh Jesus, how are You doing there? Establish here your permanent home, oh Jesus ... establish it from this morning; from this very moment, this very instant..."
St. Gemma's love for Jesus never ceases to amaze me. What an angel on this earth she was, and a glorious saint now in heaven. 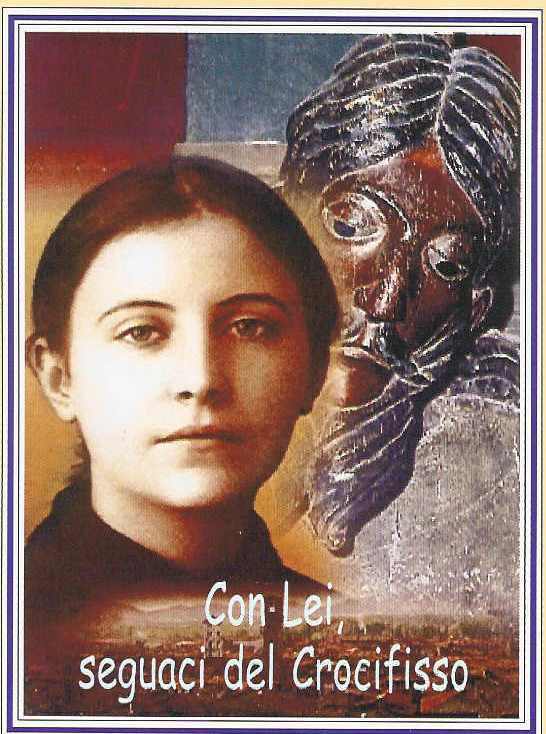 Let us pray for the canonization of Blessed Chiara Badano, who is another Gemma for our day. Gemma's love for Jesus and Mary never ceases to amaze me too... 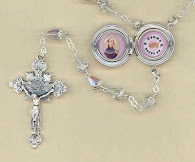 The rare book about her that I just recently aquired is full of interesting tidbits about her extraordinary love for God and things that occured in her holy life....I have been adding this new information to the website. It's so interesting for me to read all this new information about Gemma in this book and I never tire in reading about beloved Gemma! 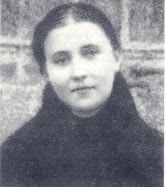 I am one of the countless souls that is captivated by this dear Saint...St Gemma, pray for us!